Universal Convergence | Shane Williamson's blog on customer centric product management, mobile convergence and desirable tech. Maybe we should be focusing on the “why” we should build MVPs versus the “what”. My trick to understanding MVPs, is that it is a process, as well as being the actual solution you are designing. The MVP process forms a part of product management from startups to enterprises, in how they perform solution or product lifecycle management. 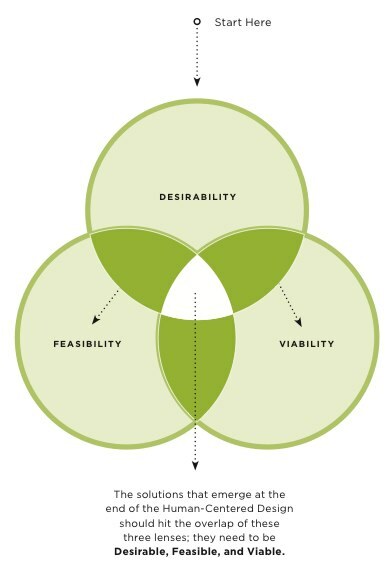 If you are building an MVP, then it should be focused through the following human centred design lenses of Desirability, Viability & Feasibility. Early adopter customers = a subset of customers of your overall addressable market. Hopefully an identifiable group that has a clear delineation of the problem(s) you are solving for. Validated means that you’ve interviewed them & they have revealed the problem to you (3rd party research is a sign post here, it is not the final destination). A value exchange – for your product to be viable, both you & the customer should receive value. If your company is looking to receive revenue, then that equates to that the customer must pay. Asking your customers “will you buy this?” is not a true value exchange. The product – with a validated & prioritised feature set for early adopters, not a product for your whole addressable market. If the solution is not aligned closely to that early adopter group, then your adding complexity and therefore possible delays in getting to market quickly. Keep focused on just those features that the early adopters perceive are the greatest value to them. An MVP should be looked is being the 1.0 version of your product you are taking to market. Not just a test, beta or a prototype (these should be used as part of the process to validate the assumptions around your solution). Human Centred Design is all about understanding the humans who will end up receiving value from your solution. If you haven’t worked out who your early adopters are, or you are building without consulting them regularly, then its probably not an MVP. Design for value versus only building for revenue. Shane Williamson is a Lean Product Management consultant who assists entrepreneurs and organisations with change management from being business-centric to customer-centric by utilising lean product management processes and tools so they focus clearly on delivering value to their customers. He came to GA to teach the part-time Product Management course in Sydney. Lately innovation has been portrayed as something akin to “The Holy Hand Grenade of Antioch“. The one thing that will solve all of your Product Management woes. Innovation is made out to be the use of bleeding edge technology, whereby you should be investigating the latest tech & digital solutions to be successful. This couldn’t be further from the reality. Innovation is a distraction. Stop using the word now & rename that “Innovation Centre” to “Fantasy World” if you have one. If there is anyone in your company that has innovation in their job title, then panic. As a company, if you haven’t addressed the Product Management fundamentals, whether the product is already in the market or currently being planned, then you too will be chasing mythical solutions for your customer’s needs (Still maybe there is a market for holy hand grenades?). The fundamentals of Product Management can naturally assist in bringing innovative products to market versus trying to innovate for innovation’s sake. Engage with your customers early & regularly. Use the lean development methodology to test regularly that you have evidence that the customer type & their problem still exists. Remember that things change, so that amazing research you discovered on the Internet from earlier this year could already be way past its due date. Change your business to be goaled on how regularly you & your staff interact with customers and measure the customer’s satisfaction of your company, products & services. How are you tracking this & more importantly how are you driving actionable tasks on this data. Set customer centric metrics early and measure regularly. How are you tracking the path for success. How is it measured both in and around your product? Everything you are building for launch should be a Minimal Viable Product (MVP). So use the MVP process to build/measure/learn what you are launching is what the customer needs to solve their problem. Feature prioritisation is a customer driven process, not business centric. What processes/methodologies do you have in place to measure the customer’s prioritisation of features you are taking to market? Your customers have a need and that need requires a solution. If you are going to be the successful company to bring that solution to market, you do not need to have the latest & greatest technology, or be utilising the latest digital trends as many would state how they see innovation. To be truly innovative in today’s market, you need to be constantly focused on your customer & their needs. Once you have the fundamentals right, the decisions of what & how to make a solution will become a break through. Thinking of starting a new business, then paint this canvas first. If you are thinking of starting a new business then I highly recommend that you start with a brilliant visual business tool called the Business Model Canvas. The Business Model Canvas helps new business by getting them to recognise that their business must exist to add value to customers. The Business Model Canvas is broken into two main sections to assist the business owner in focusing on only those components of their business that delivery value to the customer. You can think of these as the front & back off ice of your business. 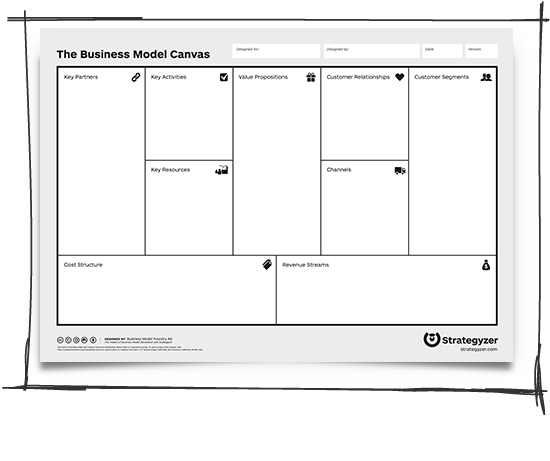 To get started download a free template of the canvas Business Model Canvas template. The best way to work on the canvas is to print it out as large as you can or draw it up on a whiteboard. Then get the team together and hand out the post-it notes. The First section to concentrate on is Customer Segments. Not just any customer segments you can sell to should to be listed here. for a new company you want to be focused on a specific customer segment called the Early Adopter. That customer that will purchase/use your product first. Next you want to fill out the Value Propositions. This is not your product. This is the value your customer will derive from your business being in existence. Focus on the needs of your early adopter here. Now complete the Customer Relationships, Channels & Revenue. This completes the “Front office” part of your canvas. Working on the “Back Office” part is focused on what you have completed in the Front office section. Only enter in components here that are directly going to effect the delivery of value to the customer. I highly recommend buying the book “The Business Model Generation” that goes into a lot of detail about the canvas including some case studies. There are some videos on the Strategyzer Youtube Channel that run through the canvas with examples too. Recently I presented at an event on using mobile in marketing. After the presentation some of the attendees asked what I meant by Digital DNA and how should mobile be a part of it. Digital DNA is a much coined term on the internet and my use of the term is from way back in the late 90’s when I was at Microsoft & Bill Gates used the term to describe his vision for companies that utilised digital technologies for their infrastructure. A company’s Digital DNA really is about how we can use technology in such a way that our business and the way we work is changed greatly. Using technology should make things easier, and more efficient. If it isn’t, then we need to quickly change the way we use it or our company will become extinct. This is Digital Evolution, or the process of survival of the fittest as Darwin prophesied it. Digital DNA is more than using technology just by itself. Digital DNA is a strategy & a process that a company should be committed to changing & monitoring regularly to measure success. Today many businesses are well on their way to a maturely developed Digital DNA but there are still components that for many reasons cause companies to halt their evolutionary process. Mobile is now a mature technology & should be utilised heavily both within our business IT infrastructure as well as how we communicate with customers & partners of our business. Outsourcing a company’s digital infrastructure by removing the expertise & management to external sources, prevents the company from retaining this company memory & being able to change competitively. Mobile needs to be part of both a company’s IT & business strategies. The more companies learn from how the devices are used within their business they will be able to more effective in communicating both internally & with customers. A good start for implementing mobile is a sound corporate platform strategy. This should be designed with the ability for multiple screen formats to interact with information and corporate IT services. This platform should be designed with screen biased task optimisation that allows developers to easily implement screen task operations that staff & customers will interact with using the three core screens of business which are the desktop, mobile & tablet devices. 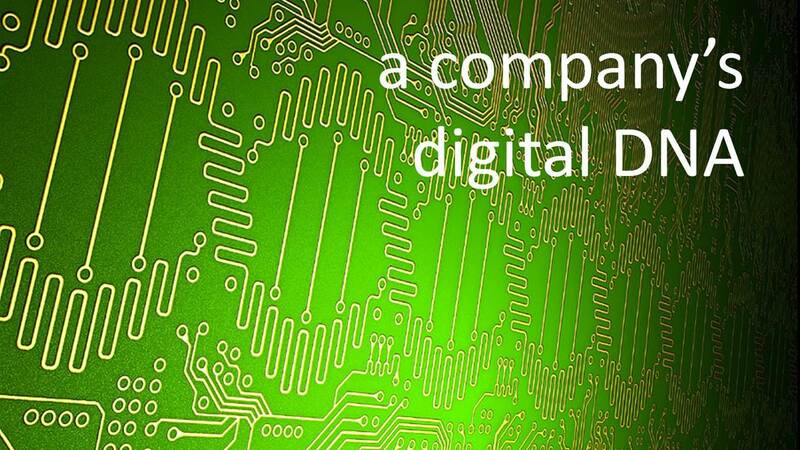 Implementing a company Digital DNA is not an overnight project, but it is started with a conversation and that conversation needs to start the process of a company’s Digital Evolution process so it will be the fittest to survive. The Onkyo TX-NR809 is a dream mid-range amplifier for Home Theatre enthusiasts. Even more so, for those passionate about getting the most out the heart of a home theatre system and expressing their inner geek with demonstrating some cool mobile convergent capability. I recently upgraded to this big boy’s toy after a massive fail purchase with a Pioneer SC-LX73 amplifier that fried itself within the warranty period and took pioneer over 5 weeks to repair, let alone attempt to even replace it. In the end, the good folk at JB HiFi (Belrose, NSW Australia) swung into action by refunding my purchase and steering me back on track by offering me the Onkyo TX-NR809 as a replacement. This Onkyo TX-NR809 amplifier is simply brilliant. I haven’t been this impressed by an amplifier since I first purchased my home theatre back in 1999. 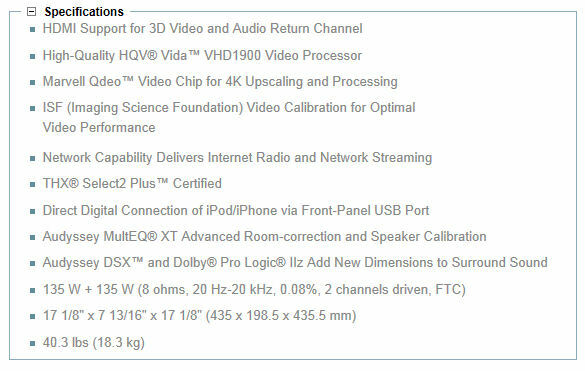 The specs alone are impressive for a sub AUS$2K device, but the high-end features, setup, high quality on-screen display & ease of use, make this a must buy for those looking for a mid-range all-you-can-eat buffet of interconnected convergent goodness. Setting up a dedicated amplifier with other 3rd party home theatre equipment is challenging at the best of times, and all but a die-hard few, throw in the towel to let the professionals take the lead here. The Onkyo TX-NR809 has a decent self setup system that uses an included microphone to listen to the speakers you have active and allows the user to tailor the system for up to 8 listening settings. This means you can quickly & effectively setup your speaker type, distance to listening position, power ratings & sub-woofer in one easy to follow session. One of the great features that have been introduced to modern amplifiers is Internet connectivity. Through either an ethernet cable or wirelessly with an optional USB wireless dongle, this amplifier is hooked directly into internet services for both updating itself with new firmware and playing streaming media. As soon as I was plugged in the system to my home network, it updated itself to the latest firmware with no network setup. A user-friendly menu system also allows you to listen to both internet radio services as well as connect directly to any DLNA enabled media server on your network. 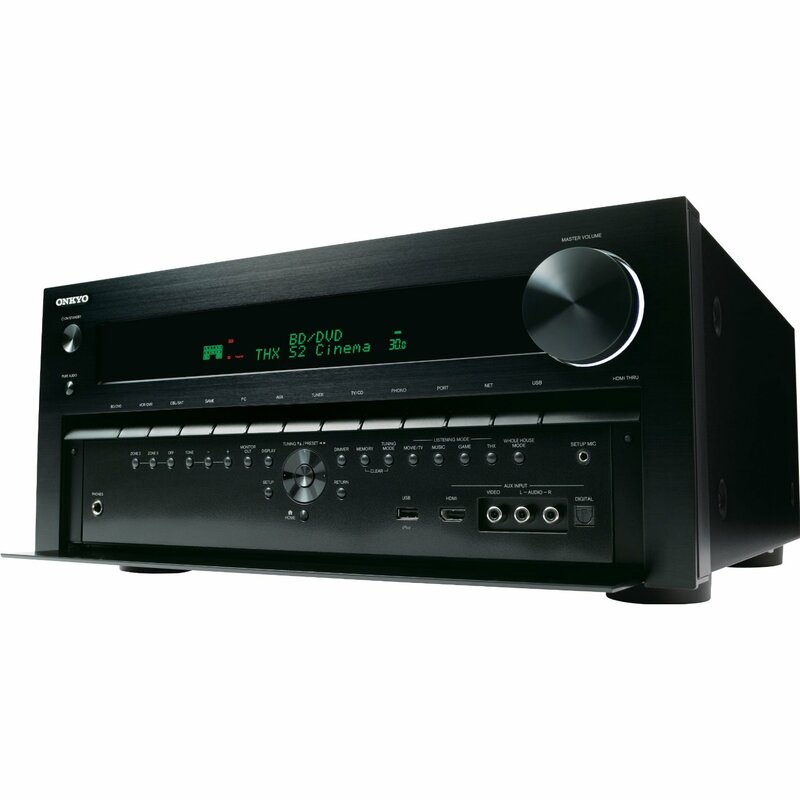 The Onkyo TX-NR809 has up to 3 zones that you can setup for audio playback. That means that whilst you are watching & listening the latest Blu-Ray movie, two other areas (or zones) of the house can listen to other independent audio sources. The zone feature is house party magic when you activate to play the same audio across all zones at the same time. Finally, the best for last, the Onkyo Android application is a geeky convergent addition to the amplifier and incredibly, it is free! Through the connectivity of your home network the mobile application can control your amplifier’s main features. This is fantastic for when you are in one of the independent zones of the amplifier and can fire up some music, either streaming from the internet or direct via a home networked media server. 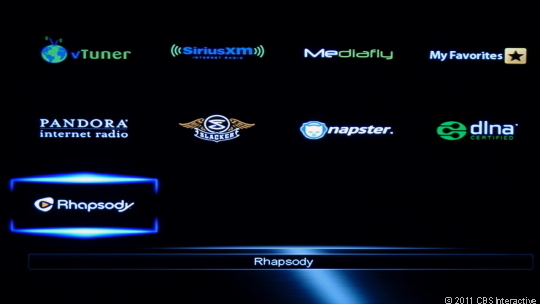 The android application can also play music directly from your device and stream it to the amplifier. The rear panel shows the usual compressed myriad of interconnected bits & pieces one finds on modern amplifiers today, but I found the speaker connections to be placed well enough apart making it simple process to connect my Energy AC-300’s directly into it. Note also that it includes a PC, VGA interface too. I’ve also ordered some Polk Audio OWM5s speakers (150W each) for the lounge room as the second audio zone, so I’ll update once they arrive from the US. In summary, the Onkyo TX-NR809 is a sound mid-range amplifier investment for those looking to upgrade from older systems. With the price of large screen HD/3D plasma TVs dropping dramatically, this is exactly what you & your wallet been waiting for to join the full HD revolution. The Tablet we see before us today is not a new idea. I can only imagine how Microsoft founder Bill Gates must have been shaking his head in frustration when Apple announced their recent foray into the tablet realm, as he had taken steps here before, in fact many years before. One could argue he was ahead of his time, again, but the technology & operating systems of the time weren’t there quite there yet. Whatever the argument around who did what and when, is mute, due to the impact the tablet is now having on mobile today. Until the iPad appeared, tablets where a niche play for particular industries such as medical & retail. The Apple iPad made the tablet cool again, but more importantly, besides being a geeky entertainment gadget, it has made tablets a real business tool. Whilst the iPad has a lot of limitations as a business device, the user experience is exceptional. A positive user experience will obliterate the other limitations to insignificance. Many IT managers today are having to integrate tablets into their networks due to senior management demanding it. The accelerated integration is creating a perfect storm around both tablet development in hardware and software . The tablet market is exploding with many tablet variants appearing from different hardware manufacturers, all trying to stake their claim. This high level of competition is a boon for the buyer, as it is driving prices down, but increasing functionality and choice. The tablet is becoming entrenched within the mobile ecosystem as the 3rd screen of productivity & interaction especially in business. Again, whilst the iPad fails miserably at being a business grade collaborative device within the enterprise, this has not stopped people bringing it within their businesses and using it on a daily basis. The tablet fills a void that has been missing between the mobile & the desktop/laptop very nicely. That void has been a mobile device that gives functionality to transient business tasks with a capable interface for accessing and managing information without the bulk and complexity of a laptop system. The desktop PC is the dedicated task system with rich interfaces and powerful processing capability. It is a fixed office based system that allows portability through the laptop variant. Whilst the laptop cannot match a desktop cost effectively in overall functionality, it has become the desktop replacement in many organisations. The mobile is all about multitasking in motion, doing multiple things at the same time, like walking down a street and reading headlines of emails or it narrating navigation directions whilst you are driving in a car. The small screen and limited input interface impact how much we can interact with a mobile, but mobile software and services are designed with this in mind making this the ultimate on the go system. The tablet has become the hybrid to both mobile & desktop. Giving us a rich & intuitive interface for accessing and managing data with efficient portability that makes it the perfect companion when you are in-between either being out of the office or utilisng a dedicated desktop environment. Meetings are an example of how the tablet empowers the business user to access information easily, but enable data input without dragging around a laptop. Businesses should be looking at how the tablet will increase productivity and become an integral part of their device matrix for employees. Internal IT Systems need to be designed around a task orientated architecture for mobile and tablets as they are for desktop systems. External communication systems to customers must take into account that customers may utilise tablets to view websites as well as interact with online business services. The tablet is not a fad, it’s here to stay, so understand its potential and leverage it as an asset.